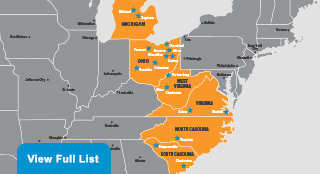 Peoples Services, Inc. is a network of 3rd party logistics companies with over 7.5 million square feet of public and contract warehouse space in 42 facilities across seven states; Michigan, Ohio, West Virginia, Virginia, North Carolina, South Carolina and Florida. Our warehouses specialize in the storage and handling of chemicals, polymers, plastics, and food grade storage with cold and freezer options. We offer a range of specialized material handling and storage services including many value-added activities such as drumming, milling, tolling, packaging, kitting, e-commerce fulfillment services, inventory management, transloading, cross docking, transportation and freight brokerage services. Many warehouses are rail served and close to interstate highways. Peoples Services is ISO 9001:2015 certified and is a member of the International Warehouse Logistics Association (IWLA), the Ohio Trucking Association (OTA), the American Trucking Association (ATA) and the Warehouse Education Research Council (WERC). Five Ohio facilities have achieved the OSHA SHARP designation (Safety and Health Achievement Recognition Program) for their reduction of hazards and low injury rates. We are also partners of the ACC Responsible Care® Management and the NACD Responsible Distribution Systems.